California Man Kills Family Over "Religious Differences"
Call me crazy… But with the information I am given in this politically correct account of a brutal murder in California, I am just slightly inclined to think that the killer might be a Muslim man. A man held for questioning in the murder of a father and daughter in California was upset with the family because they broke off his relationship with another daughter for religious reasons, court documents indicated. Friends told the Orange County Register newspaper the victims were devoutly Hindu, and court papers said the religions in question were Hindu and Muslim. Iftekhar Murtaza, 22, of Los Angeles was arrested on a fugitive warrant Saturday at Phoenix Sky Harbor International Airport in Arizona, and was being held on Wednesday without bail. An extradition hearing was scheduled Thursday. The Register reported that Murtaza had a one-way ticket to Bangladesh. 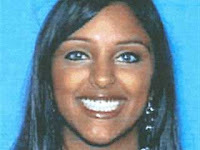 Murtaza had not been charged with a crime but was considered a “person of interest” in the deaths of Jayprakash Dhanak, 56, and his 20-year-old daughter, Karishma, Anaheim police Sgt. Rick Martinez said Wednesday. Let’s see… Two religions involved- The slain family was Hindu. Maybe the young man with the ticket to Bangladesh is Muslim? Michelle Malkin has more on this brutal mass murder.